Security agencies in the country are alarmed after a group associated with the NRM wing of NASA coalition openly distributed small arms to attendees of the Uhuru Park rally. According to sources within the security agencies and NASA coalition, a group of young men believed to be closely linked to the NASA youth leaders were making contacts with the January 30th Uhuru Park rally attendees and distributing bows and arrows as well as Ceska pistols. The group called on the people who received the arms to attack any police officer spotted so as to end the frequent killing of NASA supporters during past crackdowns. National Intelligence Service (NIS) officials who attended the rally quickly informed the security agencies to abort any plans to attack the rally or block NASA leaders from attending the same as the end result would have been a massive bloodbath claiming both innocent party supporters and security officers. It is believed that the NASA youth wings are unhappy that nobody is holding police and their commanders to account for the past killing of the supporters. The young supporters of the coalition have been urging the coalition principals to show concern to the frequent gunning down of party supporters by the police. Sources of the arms which were being distributed at Uhuru park is not clear but it is believed that some came from Uganda. The presence of arms at the podium was the key reason which prompted NASA principals, Kalonzo, Mudavadi and Wetangula to stay away from the rally. They were not prepared to see the confrontation with the security agencies nor did they think it was going to help the coalition in any way. While rumours have been swirling that an armed group of youth have been prepared to fight any attempts to arrest Raila, sources close to the NASA supremo have indicated that Raila has blocked any attempts of people close to him to arm the youth to fight the government. Raila believes that he can win the hearts and minds of people by letting the blood be on the hands of the security officers and the commanders but not people close to him. 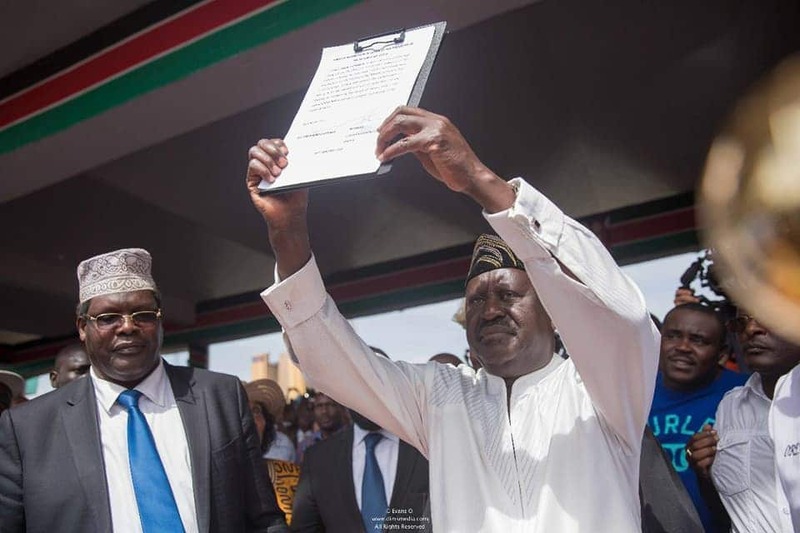 Raila is also rumoured to have opposed the idea of arms at Uhuru Park but feared that if he did appear at Uhuru Park, he was going to lose the support of most of his supporters who were already feeling let down by his frequent postponement of the swearing in. When Raila arrived at the rally, he spent just over 20 minutes at the venue before leaving in a huff with the loyal Men-In-Black taking charge of clearing the crowd while private security men were tasked with providing close protection at the venue. The private guards didn’t allow many close to Raila with most of the political leaders also kept at bay. It’s believed that the security agencies are planning a massive mop-up of the illegal arms and arresting those involved. 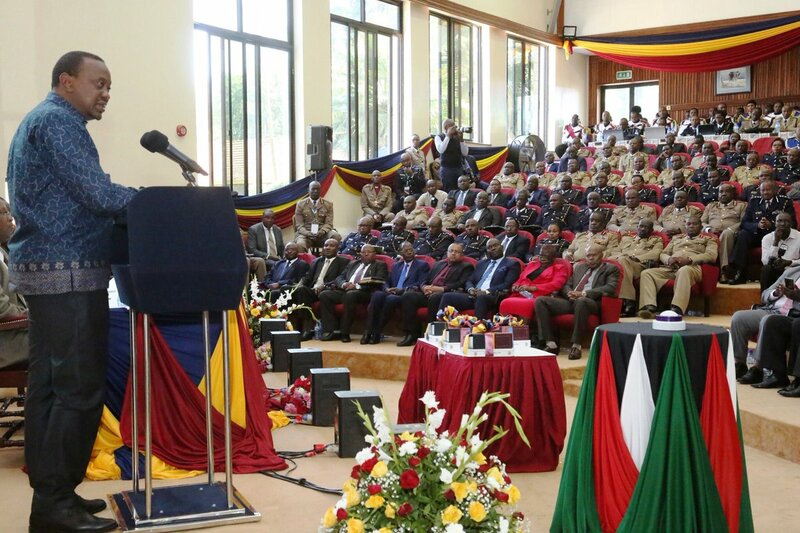 The arms is the reason why President Kenyatta decided to personally attend the IG’s conference at Kenya School of Government. He later ordered the media out and even directed Communication Authority to transfer Ksh 1billion from the Universal Service Fund to the Directorate of Criminal Intelligence accounts. He asked that the money be used to fight cybercrime while insiders believe that the order on funds transfer was because of the intelligence he received after the Uhuru Park rally.